Our Packaging & Warehousing sites provide packaging for a wide variety of products like pin markers and bottled drinks. But we have a team at our Bibra Lake location that also do something completely different. Read on about our specialty fire extinguisher disposal process and the great team behind the work! We correctly recycle and dispose of old, expired, or broken fire extinguishers that we receive from different companies. Our process is specifically designed to be as accessible as possible. Each extinguisher is sorted, fired off, and disposed of according to type. The trunk is then removed, trigger dismantled, and everything is recycled correctly. We’re happy to report that one of our employees, Kyal, is thriving in his new role as Leading Hand. He’s been a great motivator since the change last November. The team is more productive and collaborative, and there’s plenty of positive vibes going round! 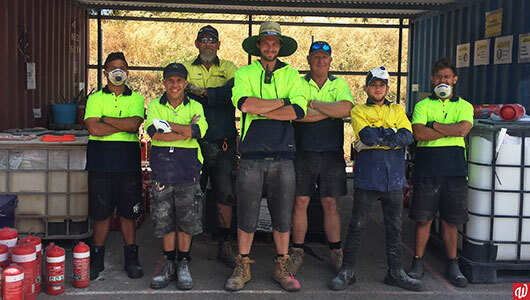 Another of our employees from Fire and Electrical Services showed an interest in working at Bibra Lake on this contract. Perry now works on the fire extinguishers two days a week and is enjoying the change. As part of our Workplace Learning program, students from Year 10 – 12 have the opportunity to experience work at one of our social enterprises during the school term. We really enjoyed having last year’s students, Brendan and Alex, with us. They quickly grew into experienced and valuable team members! Both students start transport training with our support team soon. This helps further build their independence and as they transition from school into the workplace. We wish them the best of luck for the future! Our social enterprises, like Packaging & Warehousing, are designed to provide a range of employment choices. Whether it’s work experience, skill development, or full time work, we can help you on your journey to employment. Speak to our team today via email or at 1800 610 665! Find out more about our range of supports and supported employment stories.